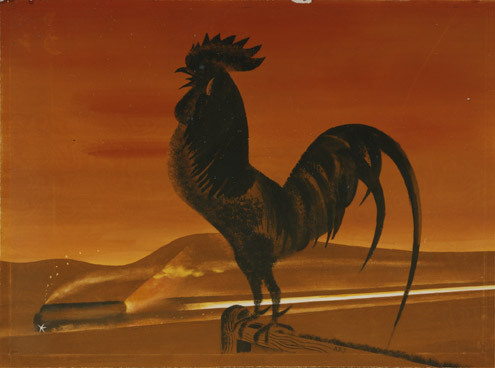 You may recognise the poem by W H Auden, used in the critically acclaimed masterpiece Night Mail from 1936. This much-loved film marked the second of five film collaborations between the Auden and the composer Benjamin Britten. This year sees the 75th anniversary of the film, and to celebrate we are putting on a special free screening. Auden scholar and author David Collard will explore the work of the GPO Film Unit and show Night Mail, as well as a selection of films by the Unit, including a variety of rarely seen shorts. The GPO Film Unit was highly innovative and from 1933 until its demise in 1940, many now celebrated talents of cinema and the arts worked for it. The films created had a major impact on British film, especially in relation to documentary film making. Benjamin Britten, W.H Auden, William Coldstream, Humphrey Jennings, Alberto Cavalcanti and John Grierson are just some of the names that appear in the credits. Films produced include documentary, animation, advertising, public information films, drama-documentary and satirical comedy on a range of subjects, from postal rates to working class pastimes. Budgets were small and rigorously enforced, to the extent that an overspend on Night Mail (1936) nearly signalled the end of the Unit. Our event Happy Birthday Night Mail: The GPO Film Unit is free and takes place on Thursday 6 October, 6.30pm – 8.00pm, in London. Full details on our website. A number of GPO Film Unit films are available on DVD. Find these in our online shop. Yesterday our deputy director Samantha Rennie and I attended a reception organised by the Parliamentary Archives in the River Room at the House of Lords. This was organised to celebrate the inscription of new archive items and collections on the UNESCO UK Memory of the World Register in 2011. Among these are the films and associated papers of the GPO Film Unit, 1933-40. The nomination was lodged by the BPMA in conjunction with BT Heritage and the British Film Institute. 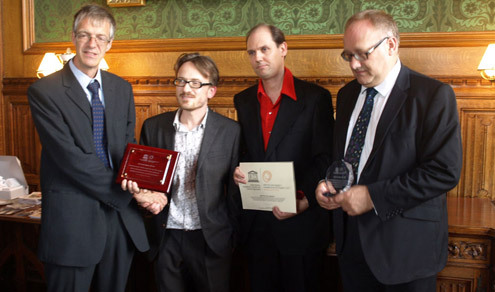 Left-right: David Dawson, Chair of the UK Memory of the World Committee, Gavin McGuffie of BPMA, Patrick Russell of the BFI, David Hay of BT Heritage. From 1933 until its demise in 1940, many now celebrated talents of cinema and the arts worked for the GPO Film Unit. The Unit’s existence is credited to Sir Stephen Tallents and it was created as part of an extensive rebranding exercise for the GPO. The films produced during the relatively short existence of the Unit had a major impact on British film, especially in relation to documentary film making. Benjamin Britten, W.H Auden, William Coldstream, Humphrey Jennings, Alberto Cavalcanti and John Grierson are just some of the names that appear in the credits and its creative impact has been immense. The UK Memory of the World Register is a list of documentary heritage which holds cultural significance specific to the UK. The inscriptions come from across the country, span nearly 1000 years of history and embody some of the pivotal moments and periods that have shaped the UK. To mark its 75th anniversary the BPMA is showing Night Mail, the most famous of the films produced by the unit, along with a variety of rarely-seen Film Unit shorts at the Phoenix Centre on Thursday 6 October from 6.30pm. Auden scholar and author David Collard (Auden wrote the poem which features towards the film’s end) will introduce the screenings. DVD boxsets of a number of GPO Film Unit films, including Night Mail, are available from our online shop. Could exclusive bonus content be the future of stamps? It’s a nice bonus for collectors, anyway. Until Monday 15th March we’re offering 15% off all orders over £10 at our Shop. So if you’ve had your eyes on something but not got around to ordering it, do it now and save. 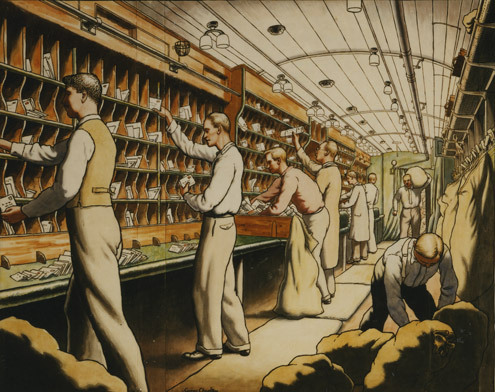 Products recently added to the online shop include greetings cards and postcards featuring our collection of GPO posters, but a range of other items are also available including t-shirts based on the Night Mail poster, a range of publications covering philately, postal history and design, and even an apron and tea towel featuring the Telegram Messengers. To obtain your discount you must order by telephone or e-mail. Just call us on +44 20 7239 5125 or email us at shop@postalheritage.org.uk with your contact details and the items you wish to purchase quoting the code “March2010”. This offer is only available when ordering by telephone or e-mail, on or before 15 March 2010. Sir Stephen Tallents, the innovative public relations man responsible for creating the GPO Film Unit, establishing poster design as an important part of the Post Office’s marketing activities and introducing the Valentines telegram (among other things), was the subject of a talk given at the BPMA on 29th October 2009 by Dr Scott Anthony, Director of the MA in Modern British History at Manchester University and author of the BFI Classics book on Night Mail. This talk is now available on our podcast. Tallents had a varied career before he joined the General Post Office (GPO). He served in the Irish Guards during World War I, but was badly injured in Festubert. Thereafter he returned to London and worked for a number of government departments until he became Secretary to the Empire Marketing Board (EMB) in 1926. The EMB’s purpose was to promote trade between British Empire nations and Tallents made full use of the modern media, setting up a film unit (led by John Grierson) and employing artists such as Edward McKnight Kauffer to design posters. When the EMB was abolished in 1933, Tallents took up public relations work for the GPO, bringing the film unit and Grierson with him, and establishing a way of working which drew on the expertise of leading figures from the arts and communications industries in a consultative capacity. Kenneth Clark, then Director of the National Gallery but later most famous for the BBC TV series Civilisation, was one of many involved. Dr Anthony’s talk examines Tallent’s career, showing how his many experiences and jobs led him to virtually invent public relations in the UK, and establish a long-lasting corporate identity and marketing strategy for the GPO. Tallent’s work in the area of poster design will be one of the subjects covered in our next podcast, in which Dr Paul Rennie, Head of Context in Graphic Design at Central Saint Martins, London, will explore the history and development of poster art and communication at the GPO. Each month, for ten months, we’ll be presenting an object from the Morten Collection on this blog. The Morten Collection is a nationally important postal history collection currently held at Bruce Castle, Tottenham. As part of a Heritage Lottery Funded project, Pistols, Packets and Postmen, the BPMA, Bruce Castle Museum and the Communication Workers Union (the owner of the Collection) are working together to widen access to and develop educational resources for the Morten Collection. If you have any comments on the objects or the Collection we’d be grateful to hear them. At the end of the ten months we hope we’ll have given you an overview of the Collection, highlighting individual items but also emphasising the diverse nature of the material. For further information on the Morten Collection, please see our blog of 16th December 2009. The Travelling Post Office (TPO) was first introduced in January 1838, travelling on the Grand Junction between Birmingham and Liverpool. The TPO is closely linked with Rowland Hill’s penny postage, which led to an increase in letter writing and the need to transport more mail at speed. The TPO ceased operation in 2004 as more and more people used emails rather than letter writing to communicate. Travelling Post Offices functioned as mobile sorting offices, allowing post officers to sort up to 2000 mails an hour while on the move. 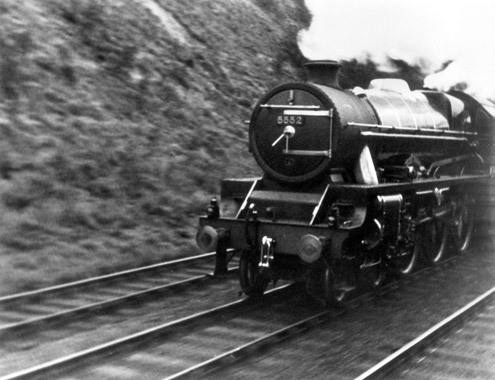 In its heyday there were some 77 services from London to Plymouth, Bristol, Newcastle and others. 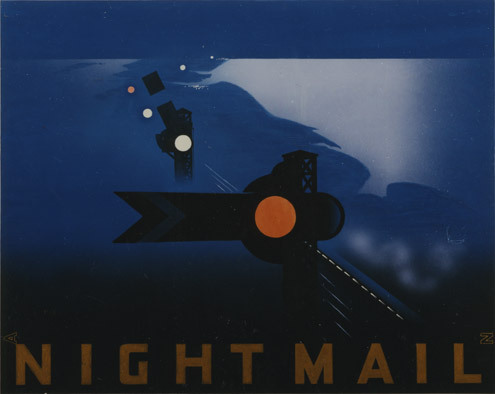 In 1936 the GPO Film unit produced a film about the TPO entitled Night Mail that contained a poem by W.H. Auden and music by Benjamin Britten. The picture featured here shows a wooden and metal model of a mail bag exchange apparatus and forms part of a set consisting of track, carriages, a hut and smaller items relating to the Travelling Post Office. Mail bag exchange apparatuses like this were used between 1852–1971 on Travelling Post Offices to pick up and put down mails without the need for trains to stop. The concept of exchanging mail whilst in transit is nothing new to railways and was used before where mail bags were often thrown onto and off coaches while in motion. Mail bag exchange apparatuses operated in the following way: Mail was simply put into leather pouches weighing between 20lb and 60lb that were attached to an arm which would suspend it 5ft above the ground and 3ft away from the carriage side. The carriage was equipped with an extendable net, fitted to the body side, with an opening into the carriage behind it to catch incoming pouches. It is alleged that the duty of putting the bags on poles was so unpopular that some postmen paid others to do the duty for them. For more on TPO’s see the BPMA’s online exhibition The Travelling Post Office.